Naturalizing – taking advantage of the ability of many spring bulbs to spread on their own – is a different planting style to try. The idea is to have the planting look as though Mother Nature designed it. This works well in deciduous shade gardens, rock gardens, along driveways, walkways and even in lawns. The flower bulbs that spread well on their own tend to be the smaller ones. They include windflowers (Anemone blanda), crocus, guinea-hen flower (Fritillaria meleagris), winter aconite (Eranthis), snowdrop, glory-of-the snow (Chionodoxa). 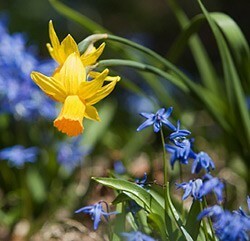 Also lovely are grape hyacinth (Muscari), daffodils and Siberian squills (Scilla siberica). Many hybrid tulips, however, can’t be counted on to spread: they look spectacular in the first year, but in the following years, their flowers often get smaller and sparser, or the plants disappear altogether, at which point, it’s advisable to replace them. For naturalizing, choose the smaller species tulips, which grow only 6 to 12 inches tall. Try the starry flowered white and gold ‘Tarda’, the cream and yellow turkestanica varieties, or the lovely canary yellow Tulipa batalinii ‘Bright Gem’. They look wonderful at the edge of flower beds, in rockeries and in small gardens. For a flowering lawn, use early, low-growing bulbs such as crocuses, daffodil cultivars such as ‘Jack Snipe’, ‘Tête à Tête’ or ‘Quail’, snowdrops, glory-of-the-snow, scillas and windflowers. These bulbs create a carpet of color and will tolerate cutting back by the time the grass needs mowing. Naturalize larger, later-blooming daffodils in areas where mowing can be put off for six weeks after they bloom, for example, along a country lane or shrub border. 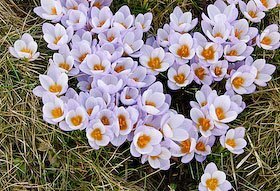 A sprinkling of small early-flowering bulbs, such as windflower, crocus, scilla, snowdrop, glory-of-the snow or grape hyacinth, looks wonderful under deciduous shrubs and trees such as ash, birch, cherry, Japanese cherry, oak, fruit trees and profusely flowering crabapples. Before leafing out, these deciduous trees and shrubs allow for plenty of sunlight early in the season when the bulbs need it. To feed your naturalized bulbs, work a good organic compost or well-rotted cow manure into the soil when planting. Then add a 1-inch layer of compost as a mulch each fall. Alternatively, apply a slow-release bulb food, such 9-9-6, when planting, and again each fall (sprinkle fertilizer over the planting area at the rate recommended on the label). To maintain your bulbs, avoid cutting back leaves before they have yellowed to allow bulbs to regenerate for next year’s flowers. Allow the leaves to grow for at least six weeks after flowering. Avoid working soil in early spring just as bulb foliage begins to grow and avoid any use of lawn herbicides while the bulb leaves are still green.